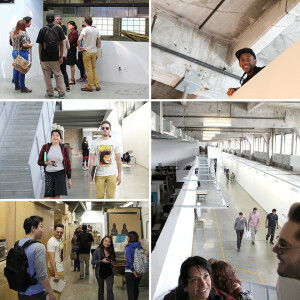 Studio 4: Private/Interior Architecture Instructor Richard Lundquist and his students, A/L/I Juniors Rex Crafts, Diana Gonong, Shadi Hashemi, Suna Jaen, Merve Onur, Ju Sung Park, Izzy Savage, Cynthia Soto and Nyann Swain-Welborn, visited and documented the Santa Fe Freight Depot (current home of SCI-Arc). They are working on the design of six live/work, “sustainable urban living” apartments that will fit within a portion of this existing structure. The six apartments will be “prototypes” that could be repeated along the entire length of the building. The interwoven cycles of collection, consumption and production permeate our lives. They order our daily routine and control our interactions with others. New communities designed for the sharing of space and resources will arise. New architecture that collects air, water, power and light will be invented. At the end of the semester students will submit their designs to the “Getting L.A. to Zero Competition,” sponsored by the Living Building Challenge Los Angeles Collaborative. The Living Building Challenge Los Angeles Collaborative (LBC-LA) is a newly formed group, whose vision is to create Living Buildings, Landscapes and Neighborhoods in Los Angeles.